Hunter and Nathan Hargis, along with their mom Marcy, paid grandparents Gerry and Lolly a spring break visit last weekend. Sarasota rolled out its very best weather for the occasion, with bright sunshine, cool breezes, and warm temperatures. 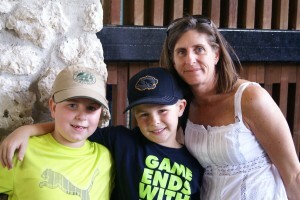 We spent one full (very full) day at Busch Gardens, our favorite theme park just up the road in Tampa. We can attest to the fact that the Cheetah Hunt, the park’s newest roller coaster, is as exciting as it looks in the advertising — three minutes of non-stop high-speed loops, twists, turns, climbs, and plummets. At age nine, the boys weren’t tall enough to ride SheikRa, the most extreme of the coasters in the park; but we’re pretty sure the next time they visit we’ll really be in for it. Just visualize a ninety-degree drop from 300 feet above the ground, feet dangling in midair, followed by an endless series of loops and rolls and one breathless rush through a pool of water. 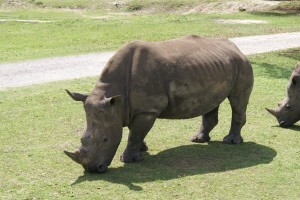 We all enjoyed the wildlife safari experience, where we became very good friends with a pair of romaine-loving giraffes and saw the park’s resident rhinos, wildebeest, impalas, kudus, zebras, elephants, and other African creatures in their free-roaming habitat. The next day we went on a two-hour cruise in Sarasota Bay aboard LeBarge, a big tour boat with four big palm trees growing in pots on the upper deck. An onboard marine biologist served as our guide, and we saw several of the bay’s bottlenosed dolphins fishing for their lunch, as well as three manatees swimming over beds of seagrass near shore. We preceded this with a visit to the Saturday Market, just outside our door, where Gerry bought shrimp and fish, while Nathan and Hunter scoped out the ubiquitous dogs and the market pastries, opting in the end for Pastries as Art offerings, just around the corner on Main. (Good choice!). Coming home, they spotted Mattison’s City Grille, an open air dining spot, and it was decided that Saturday night’s dinner choice was made, especially after Nathan learned that there was dancing with a live band every night. Also, there was an Arts and Crafts Fair along two blocks of Main, which the boys perused after the boat excursion, buying custom visors and foam coasters, while Marcy and Laurie were unable to resist a Tennessee vendor’s ingenious grill cleaning tool. Back at our condo, late Saturday afternoon, we spent an hour or so at the pool, but cut it a little short to watch our horse, In Lingerie, run in the Bourbonette Oaks Stakes on NBC ( see previous post). Much cheering and screaming ensued as In Lingerie coasted to a 6 length win that probably sends her to the Kentucky Oaks, the filly equavalent of the Kentucky Derby. Look for posts related to the Oaks, which we will attend if possible. The dudes finished off their visit with dinner at Mattison’s City Grille Saturday night, a downtown outdoor venue with a band, dancing area, bar, and many, many tables for dining. After our dinner, Nathan proceeded to the dance floor, where he wowed the assembled crowd and danced the night away, carefully monitored by his mother. His grandparents faded back home with Hunter, who finished off his visit with a killer poker game with Lolly. For more photos of the visit link here. Ask Hunter who won the poker game. We’ve been taking private photography and Photoshop lessons for the past few years, and this year our teacher sponsored a contest for all his students. Each of our photos had to relate to one of four themes — Curves, Reflection, Repetition, and Empty — and our fellow students were the judges. It was a terrific learning experience for us, and we were very pleased with our own efforts, as well as impressed by what our classmates achieved. Gerry’s entries won in two categories, a real thrill for him since he has generally left the picture-taking to me in the past. I can see a second good camera in our future. If you’d like to see our contest entries, this is a link to the gallery. Click on any individual photo to enlarge it. See if you can match the pictures to the categories (since we haven’t yet figured out how to put captions on the photos) and identify which two photos won in their categories. 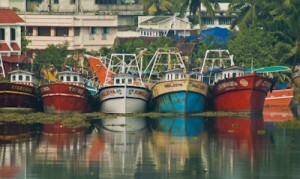 For example, the photo in this post is entitled “Fishing Fleet at Cochin” and was entered in the Reflection category.